This week has been my first week working from home, so I have been trying to adjust to a new routine. Funemployment brought out my lazy, indulgent side; whipping myself back into shape has proven a painful process. I’ll share a glimpse of working from home soon, and discuss my frustrations with modern life in the digital age and the challenge of setting realistic expectations. All in due time, my friends. They are significantly healthier than the average chocolate chip cookie. They are significantly less unhealthy than most chocolate chip cookies. Let’s call them reasonably healthycookies. Why? 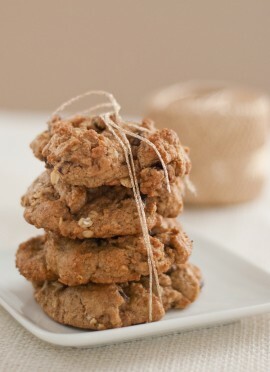 They are 100% whole grain, made with whole wheat pastry flour and old fashioned oats. Do we need to discuss the benefits of fiber? Make them with dark chocolate chips, and you’ve incorporated some antioxidants. 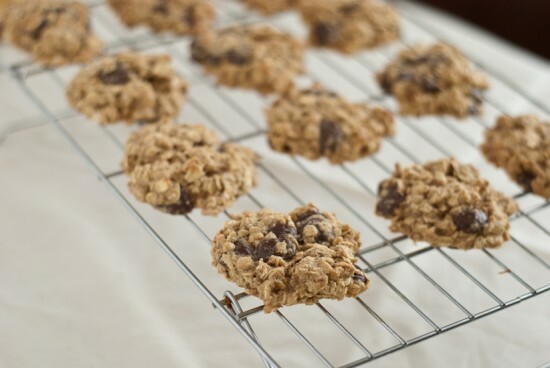 The recipe is a combination of Gina’s recipes for Low Fat Chewy Chocolate Chip Oatmeal Cookies, which uses applesauce in place of most of the butter, and Chewy Low Fat Banana Nut Oatmeal Cookies, which calls for mashed banana instead of applesauce. I thought, wouldn’t banana taste great in chocolate chip cookies? And can I trade all-purpose flour for wheat? Success! 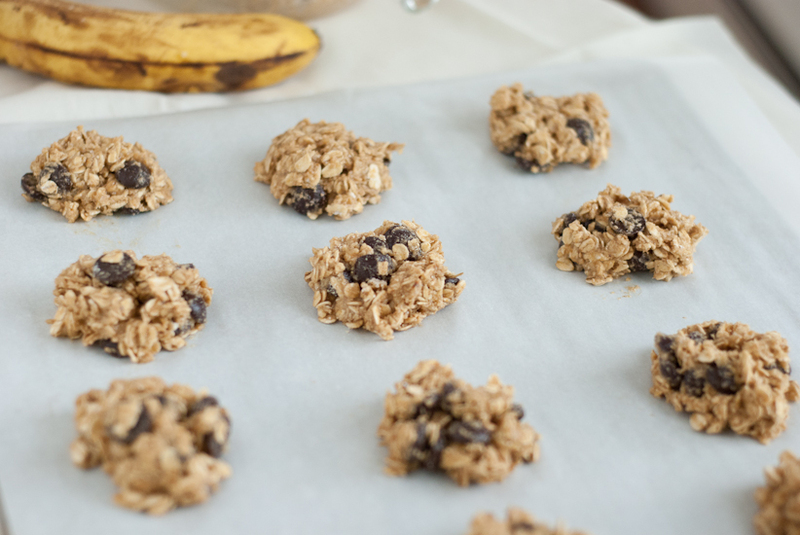 These delicious, chewy banana chocolate chip cookies are, coincidentally, low in fat and made with 100% whole grains! No one will even notice! ¾ cup dark chocolate chips (Ghirardelli 60% cacao chips are my favorite! ), OR walnuts, if you’re into that. In a medium bowl, whisk together flour, oats, baking powder, baking soda, salt and cinnamon. In a large bowl, cream together the butter and the sugars. I used an old-fashioned egg-beater but if you’re lucky enough to have an electric mixer, cream the butter and sugar on medium speed. Working by hand, stir in the flour mixture and the oats until just combined. 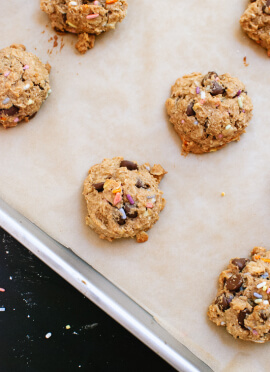 Drop heaping spoonfuls onto baking sheets, flattening each cookie slightly. Bake for about 10-12 minutes, or until cookies become light brown at the edges. Do not overbake these cookies! Yields about 30 cookies (roughly 1 tbsp each). Note on apple sauce, added 5/20/11: I just tried these cookies with apple sauce instead of mashed banana. While they are tasty, they seem a little more like reduced fat cookies. The banana cookies have a fluffier texture, with a higher rise and softer insides. Final verdict? I’m sticking with banana. Yummy. I love banana and chocolate together. I just finished lunch and now I want some of your cookies! Considering how often you make cookies, I’m not surprised by your little guy’s name. Even though you’re working from home now, don’t work too much this weekend! Have a good one! You’re right, I have been making lots of cookies lately! I saved a few of these for me and put the rest in the freezer for when I have company. I feel like my grandmother when I do that, but it’s so much easier to resist temptation that way! She’s a smart lady. Oh boy, now I have to try your version!!! Glad you liked them!! Mmm these look yummy! 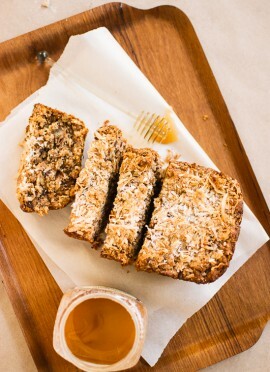 Love banana in baked goods! Ohh wow! I have been trying to eat healthier with more nuts and oatmeal type stuff and this is right down my alley. Awesome job, I am trying them this week! Yep, I’m making these tonight! Hooray! Please let us know how they turn out! Well, I made them and they are awesome. I accidentally veganized them as I realized had no butter or eggs in the house, but they still turned out really great (although I’m new to photography so maybe they don’t LOOK great). They sure didn’t taste vegan at all. Thanks for the recipe! Good to know! I never would have guessed they would turn out well without eggs or butter. I wish I hadn’t eaten all of mine already! Those look stinking DELICIOUS! And oh so wholesome and healthy. Thanks for sharing! I’ll be trying these out soon. I just made these– so good! I added a little more vanilla extract, but they came out spongy and delicious. I made these last night and they are spectacular – probably one of my new favorite cookie recipes because it combines my fave things into one: choc chip cookies and banana bread! I made a few changes. Instead of one ripe banana, I used 2 since I had them. This created a more gooey cookie – which is NOT a bad thing. If you like them more dense, just add more flour. I used the Turbinido raw sugar which I found in the store, no problem. Great discovery from a baking perspective; can’t wait to use it again, even for sprinkling on cakes and breads. And if you use more banana, you can eliminate some sugar since the natural sugar in the fruit makes it sweet enough. For a final touch, I added 1/2 cup coconut into the batter, which gave it a little more crunch. Thank you Kate, love your recipes! Despite how much I messed up the recipe, I made these tonight and they are AWESOME!! Hmmm, they are in the oven right now. I only added one tablespoon peanut butter (I loove peanut butter), and the dough was the best cookie dough I ever ate! Oh, I veganised It because I’m a vegan, with an Egg-Replacer and margerine.I love oat-cookies, I love bananas, I love cinnamon, I love pb and I love chocolate!! The best recipe ever! I hope those cookies turned out as good as the batter tasted, Jana! I am definitely going to add some peanut butter to mine next time around. Yum! They are great. Taste good like banana and like oats, and the cinnamon and the peanut butter perfect the taste. I made half with chocolate chips and half without, and even I love chocolate, these without taste even better to me! Thanks for this recipe!!! Oh, I’m so glad! I might have to make another batch just so I can try them with peanut butter. Yum. thanks for the recipe! my best friend is hooked and i am making them again tonight for our company coming for dinner! Thank you for commenting, Ashley! I’m so glad you enjoyed the cookies. I’m glad to know that they’re great without any butter at all! I picked out this recipe to try over the holidays when I home from college for winter break. I never got around to making the cookies, but to my surprise, a box arrived at my apartment this morning, it was filled with 2 dozen of these cookies! My mom made the cookies after finding the recipe in the kitchen and remembering my excitement. The note enclosed with the home made cookies reads: “Ellen, Here are the chocolate chip banana cookies from the recipe you got from cookiesandkate.com. They turned out good! Love you, Mom xxoo. Just wanted to share this story of love that made my day! Happy with the result! I’ve tried other recipes of yours but this is my first comment. I love the banana and dark chocolate combo, but unfortunately when I got to that step, my ripe banana was missing from the basket! The compost jar held the evidence… Alas it was my last banana and I didn’t have any applesauce. So I improvised by adding mashed fresh strawberries. Wow. What a cookie! I will still try again with bananas, but the berries were a nice mistake. Kate, your cookies sound like quite a delicious mistake! I’ve been wondering lately if I could substitute mashed strawberries for bananas, so I’m glad to know that it worked for this recipe, at least! Thank you for commenting! I tested these out today and they were so delicious! I left out the egg and butter, upped the banana some, and actually meant to use the brown sugar but forgot it… it was still delicious! I made it using peanut butter chips, and I will definitely be making this again soon! Glad you liked the cookies, Ashley! Since I bake with no gluten, I’m wondering how these will turn out with gluten-free flour. Will they keep together or flatten out? I will try to make them with a mix of brown rice flour, almond flour and maybe some other kinds of gf flours to see how they turn out. If I remember, I’ll try to report back here about them. I’m allergic to bananas (darn!) so I will have to try them with the apple sauce. Otherwise, these seem like incredible cookies! I don’t have much experience substituting with gluten-free flours, to tell you the truth. Please let us know how the cookies turn out! Girl. Friend.These cookies look amazing! Just found you’re blog today and I LOVE your adventurous baking style. Can’t wait to try your recipes! Yum! Didn’t have whole wheat pastry flour so I just used whole wheat flour. Also, I added some honey which added to the taste AND made then stick easier. Turned out great! Thanks, Lisa. I’m glad you made the recipe work for your family! I estimated the calories online and it came out to 115 each. Anyone know if that’s close? P.S. These are delicious and stay moist for days. I added 1/4c of unsweetened applesauce to mine to hold them together a bit more. Thanks, Kate! Glad you enjoy the cookies. I don’t usually run calorie counts on recipes but I bet your estimate is about right. Wow. These were even better than I expected! My husband couldn’t stay away from these…and OK, nor can I! We were under a major fruit fly attack, so I made a double batch of the batter a few days ago to get rid of some bananas, but had no time to bake the cookies right away. I dumped the dough into some tupperware and let it sit in the fridge until this morning. Definitely didn’t seem to hurt the cookies at all. Thanks, Kate! Glad you both enjoyed the cookies! These are amazing! I made them before reading the comments so will have to try without butter next time. Only problem with them is that I can’t stop eating them!! Going to have to put some in the freezer :) It made exactly 30 cookies (using a cookie scoop). Thanks for commenting, Heather! I’m so glad you enjoy the cookies! This recipe is EXACTLY what I was looking for. Thanks!!! Kate, this is an awesome recipe! Like some of the other people who commented, I substituted two bananas for butter and eggs, used 1/2 wheat and 1/2 all-purpose, and also ground the oats since I’m not a fan of the texture in cookies. Flattening out the cookies properly made them bake evenly. Thanks, Aqui! Glad you liked ’em! I have a question, do you cook the oats first or just raw when you start mixing the ingredients? Might be a silly question but just want to ask! 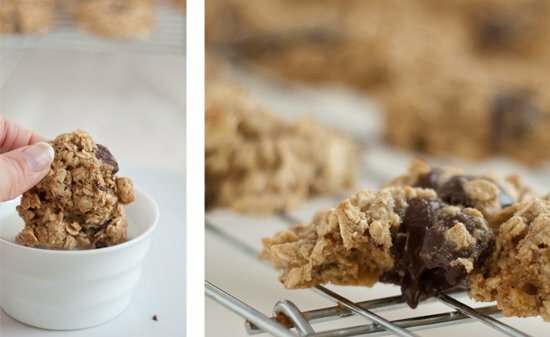 I live in Australia and I am absolutely in love with Cookie and your recipes, I have only just come across your website. I am wondering what else I might be able to use instead of whole wheat flour? Or is that just wholemeal flour that we have down under? I believe they are the same thing, yes! Terrific recipe! We used one ripe banana, 2 tablespoons light butter, 1/4 cup toasted chopped walnuts, and it tasted like banana bread but with an excellent crunch! Always looking for low-fat recipes and that’s hard to do with cookies! I just made this while scanning for a new ‘treat’ for lunches this week. Your recipes NEVER disappoint and always turn out perfect. I hope your cookbook is out soon! 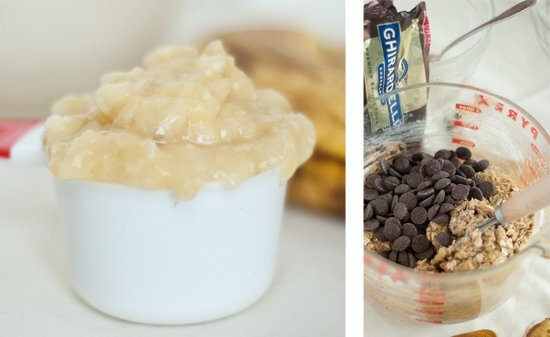 Trying to eat healthier and was thinking about adding more fruit to sweets to cut back on sugar and I found your recipe. And now trying to bake quick, the sneak taste was delist….Oh, can you freeze the dough? This is such a good recipe. I used ground flax and water for the egg and pureed white beans for the butter. Came out delicious. These are sooo good! I actually made them using the applesauce and not banana since my boys are not fans of banana in baked goods. I also used Bob’s Red Mill extra thick rolled oats which gave them a nice hearty flavor. Boy did they LOVE these and so did I :) I would even consider using slightly less sugar and really like that there is little butter/oil. Thanks – these are keepers! Wonderful! I’m glad your swap-out worked well. Hi Kate, made this today. I made it without eggs and added a little olive oil to hold the cookies. Turned out a bit dry but tastes great! I also love your healthy banana bread recipe. I live banana flavours in my food. Your recipes are awesome..tasty and healthy just the way I like to cook. Thanks so much for awesome recipes. You’re welcome! Thank you for your review, Ailia! Sounds delicious, Fran! Thanks so much for your review. I made these today and they are delicious. They even got my husband’s 5-star seal of approval! He’s the chocolate chip cookie expert at our house. Thanks for a healthier version. Love it! Thanks for sharing, Vickie! I tried only 1/2 batch of this recipe and substituted 1/2 of chocolate chip with dried cranberry, it turns out soooo well that I regretted that I only baked 1/2 batch!!!! Love your recipe! they never failed me. I’m so glad to hear that! Thanks so much for your review, Sandy.